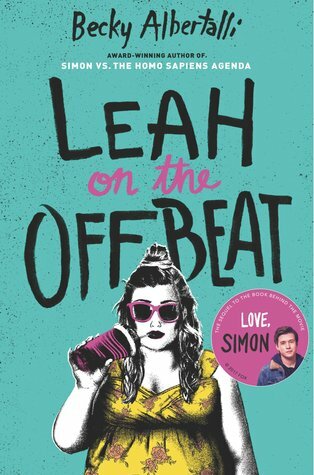 Leah on the Offbeat is a companion novel to Simon vs. the Homo Sapiens Agenda (one of my favorite books of all time). While it can be read separately, I would recommend reading SVTHSA first just because this book does spoil Simon’s ending. Leah on the Offbeat takes place in Leah’s senior year as she’s just trying to survive the last few weeks of high school and prepare for the future. In Simon vs. The Homo Sapiens Agenda, Leah was not my favorite character. At all. But that didn’t take away from my enjoyment of this book. I loved Leah’s story, and what she’s going through. This book builds on the characters from Simon’s book, making them more three dimensional and real. However, as I saw different sides of them I did find them less likable which wasn’t fun (except for Simon and Bram who I just loved even more in this book. I didn’t know how that was possible). After finishing this book, I just wanted to reread Simon again to see these characters as Leah shows them. The plot of this book really just revolves around the friendships and relationships as prom approaches. There really isn’t much going on. There’s drama and stress about their future, but that’s really it. That said, I would read about these characters watching TV for 400 pages and still enjoy it because of how Becky Albertalli writes them. Becky makes even the blandest moments hilarious with her writing style, and even the most simple moments become heartbreaking. She is absolutely amazing and I’m not entirely convinced she’s human. I laughed so much in this book, and I wanted to cry almost as much. It was fantastic. There are a lot of great themes in this book. Leah has to deal with goodbyes, and growing up. And honestly, despite having graduated from high school a couple of years ago, it hit me hard. It felt so real and honest. Leah on the Offbeat also deals with sexuality, specifically bisexuality, and while I liked it and enjoyed it being included, it didn’t quite hit home like in Simon vs. the Homo Sapiens Agenda. But that’s okay. These books are different and Leah’s at a different stage than Simon was at the start of his book. However, I did get annoyed with Leah at times with how she dealt with her love interest’s struggle with their sexuality (and yes I’m being purposely vague so I don’t spoil anything). Leah on the Offbeat is an amazingly written, hilarious, and heart-wrenching contemporary novel that shows the struggle of high school life, as well as saying goodbye to it. However, it doesn’t quite reach the level of awesomeness of the book that first introduced us to these characters.